A plasma display panel (PDP) is a type of flat panel display that uses small cells containing plasma; ionized gas that responds to electric fields. Plasma displays are bright (1,000 lux or higher for the module), have a wide color gamut, and can be produced in fairly large sizes—up to 3.8 metres (150 in) diagonally. They had a very low-luminance "dark-room" black level compared with the lighter grey of the unilluminated parts of an LCD screen. (As plasma panels are locally lit and do not require a backlight, blacks are blacker on plasmas and greyer on LCDs.) LED-backlit LCD televisions have been developed to reduce this distinction. The display panel itself is about 6 cm (2.4 in) thick, generally allowing the device's total thickness (including electronics) to be less than 10 cm (3.9 in). Power consumption varies greatly with picture content, with bright scenes drawing significantly more power than darker ones – this is also true for CRTs as well as modern LCDs where LED backlight brightness is adjusted dynamically. The plasma that illuminates the screen can reach a temperature of at least 1200 °C (2200 °F). Typical power consumption is 400 watts for a 127 cm (50 in) screen. Most screens are set to "shop" mode by default, which draws at least twice the power (around 500–700 watts) of a "home" setting of less extreme brightness. The lifetime of the latest generation of plasma displays is estimated at 100,000 hours of actual display time, or 27 years at 10 hours per day. This is the estimated time over which maximum picture brightness degrades to half the original value. Plasma screens are made out of glass, which may result in glare on the screen from nearby light sources. Currently, plasma panels cannot be economically manufactured in screen sizes smaller than 82 centimetres (32 in). Although a few companies have been able to make plasma enhanced-definition televisions (EDTV) this small, even fewer have made 32 inch plasma HDTVs. With the trend toward large-screen television technology, the 32 inch screen size is rapidly disappearing. 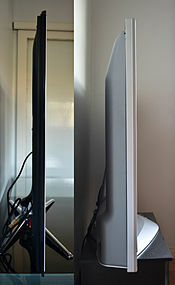 Though considered bulky and thick compared with their LCD counterparts, some sets such as Panasonic's Z1 and Samsung's B860 series are as slim as 2.5 cm (1 in) thick making them comparable to LCDs in this respect. Competing display technologies include cathode ray tube (CRT), organic light-emitting diode (OLED), AMLCD, Digital Light Processing DLP, SED-tv, LED display, field emission display (FED), and quantum dot display (QLED). Capable of producing deeper blacks allowing for a superior contrast ratio. As they use the same or similar phosphors as are used in CRT displays, plasma's color reproduction is very similar to that of CRTs. Wider viewing angles than those of LCD; images do not suffer from degradation at less than straight ahead angles like LCDs. LCDs using IPS technology have the widest angles, but they do not equal the range of plasma primarily due to "IPS glow", a generally whitish haze that appears due to the nature of the IPS pixel design. Less visible motion blur, thanks in large part to very high refresh rates and a faster response time, contributing to superior performance when displaying content with significant amounts of rapid motion. Superior uniformity. LCD panel backlights nearly always produce uneven brightness levels, although this is not always noticeable. High-end computer monitors have technologies to try to compensate for the uniformity problem. Unaffected by clouding from the polishing process. Some LCD panel types, like IPS, require a polishing process that can introduce a haze usually referred to as "clouding". Less expensive for the buyer per square inch than LCD, particularly when equivalent performance is considered. Earlier generation displays were more susceptible to screen burn-in and image retention. Recent models have a pixel orbiter that moves the entire picture slower than is noticeable to the human eye, which reduces the effect of burn-in but does not prevent it. Due to the bistable nature of the color and intensity generating method, some people will notice that plasma displays have a shimmering or flickering effect with a number of hues, intensities and dither patterns. Earlier generation displays (circa 2006 and prior) had phosphors that lost luminosity over time, resulting in gradual decline of absolute image brightness. Newer models have advertised lifespans exceeding 100,000 hours, far longer than older CRTs. Uses more electrical power, on average, than an LCD TV using a LED backlight. Older CCFL backlights for LCD panels used quite a bit more power, and older plasma TVs used quite a bit more power than recent models. Does not work as well at high altitudes above 6,500 feet (2,000 meters) due to pressure differential between the gases inside the screen and the air pressure at altitude. It may cause a buzzing noise. Manufacturers rate their screens to indicate the altitude parameters. For those who wish to listen to AM radio, or are amateur radio operators (hams) or shortwave listeners (SWL), the radio frequency interference (RFI) from these devices can be irritating or disabling. Plasma displays are generally heavier than LCD and may require more careful handling such as being kept upright. 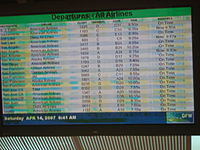 Fixed-pixel displays such as plasma TVs scale the video image of each incoming signal to the native resolution of the display panel. The most common native resolutions for plasma display panels are 853×480 (EDTV), 1,366×768 or 1920×1080 (HDTV). As a result, picture quality varies depending on the performance of the video scaling processor and the upscaling and downscaling algorithms used by each display manufacturer. Early plasma televisions were enhanced-definition (ED) with a native resolution of 840×480 (discontinued) or 853×480, and down-scaled their incoming High-definition video signals to match their native display resolution. The following ED resolutions were common prior to the introduction of HD displays, but have long been phased out in favor of HD displays, as well as because the overall pixel count in ED displays is lower than the pixel count on SD PAL displays (853×480 vs 720×576, respectively). Early high-definition (HD) plasma displays had a resolution of 1024x1024 and were alternate lighting of surfaces (ALiS) panels made by Fujitsu/Hitachi. These were interlaced displays, with non-square pixels. Modern HDTV plasma televisions usually have a resolution of 1,024×768 found on many 42 inch plasma screens, 1280×768, 1,366×768 found on 50 in, 60 in, and 65 in plasma screens, or 1920×1080 found in plasma screen sizes from 42 inch to 103 inch. These displays are usually progressive displays, with non-square pixels, and will up-scale and de-interlace their incoming standard-definition signals to match their native display resolution. 1024×768 resolution requires that 720p content be downscaled in one direction and upscaled in the other. Ionized gases such as the ones shown here are confined to millions of tiny individual compartments across the face of a plasma display, to collectively form a visual image. A panel of a plasma display typically comprises millions of tiny compartments in between two panels of glass. These compartments, or "bulbs" or "cells", hold a mixture of noble gases and a minuscule amount of another gas (e.g., mercury vapor). Just as in the fluorescent lamps over an office desk, when a high voltage is applied across the cell, the gas in the cells forms a plasma. With flow of electricity (electrons), some of the electrons strike mercury particles as the electrons move through the plasma, momentarily increasing the energy level of the atom until the excess energy is shed. Mercury sheds the energy as ultraviolet (UV) photons. The UV photons then strike phosphor that is painted on the inside of the cell. When the UV photon strikes a phosphor molecule, it momentarily raises the energy level of an outer orbit electron in the phosphor molecule, moving the electron from a stable to an unstable state; the electron then sheds the excess energy as a photon at a lower energy level than UV light; the lower energy photons are mostly in the infrared range but about 40% are in the visible light range. Thus the input energy is converted to mostly infrared but also as visible light. The screen heats up to between 30 and 41 °C (86 and 106 °F) during operation. Depending on the phosphors used, different colors of visible light can be achieved. Each pixel in a plasma display is made up of three cells comprising the primary colors of visible light. Varying the voltage of the signals to the cells thus allows different perceived colors. The long electrodes are stripes of electrically conducting material that also lies between the glass plates in front of and behind the cells. The "address electrodes" sit behind the cells, along the rear glass plate, and can be opaque. The transparent display electrodes are mounted in front of the cell, along the front glass plate. As can be seen in the illustration, the electrodes are covered by an insulating protective layer. Control circuitry charges the electrodes that cross paths at a cell, creating a voltage difference between front and back. Some of the atoms in the gas of a cell then lose electrons and become ionized, which creates an electrically conducting plasma of atoms, free electrons, and ions. The collisions of the flowing electrons in the plasma with the inert gas atoms leads to light emission; such light-emitting plasmas are known as glow discharges. Relative spectral power of Red, Green and Blue phosphors of a common plasma display. The units of spectral power are simply raw sensor values (with a linear response at specific wavelengths). In a monochrome plasma panel, the gas is mostly neon, and the color is the characteristic orange of a neon-filled lamp (or sign). Once a glow discharge has been initiated in a cell, it can be maintained by applying a low-level voltage between all the horizontal and vertical electrodes–even after the ionizing voltage is removed. To erase a cell all voltage is removed from a pair of electrodes. This type of panel has inherent memory. A small amount of nitrogen is added to the neon to increase hysteresis. In color panels, the back of each cell is coated with a phosphor. The ultraviolet photons emitted by the plasma excite these phosphors, which give off visible light with colors determined by the phosphor materials. This aspect is comparable to fluorescent lamps and to the neon signs that use colored phosphors. Every pixel is made up of three separate subpixel cells, each with different colored phosphors. One subpixel has a red light phosphor, one subpixel has a green light phosphor and one subpixel has a blue light phosphor. These colors blend together to create the overall color of the pixel, the same as a triad of a shadow mask CRT or color LCD. Plasma panels use pulse-width modulation (PWM) to control brightness: by varying the pulses of current flowing through the different cells thousands of times per second, the control system can increase or decrease the intensity of each subpixel color to create billions of different combinations of red, green and blue. In this way, the control system can produce most of the visible colors. Plasma displays use the same phosphors as CRTs, which accounts for the extremely accurate color reproduction when viewing television or computer video images (which use an RGB color system designed for CRT displays). Plasma displays are different from liquid crystal displays (LCDs), another lightweight flat-screen display using very different technology. LCDs may use one or two large fluorescent lamps as a backlight source, but the different colors are controlled by LCD units, which in effect behave as gates that allow or block light through red, green, or blue filters on the front of the LCD panel. Contrast ratio is the difference between the brightest and darkest parts of an image, measured in discrete steps, at any given moment. Generally, the higher the contrast ratio, the more realistic the image is (though the "realism" of an image depends on many factors including color accuracy, luminance linearity, and spatial linearity.) Contrast ratios for plasma displays are often advertised as high as 5,000,000:1. On the surface, this is a significant advantage of plasma over most other current display technologies, a notable exception being organic light-emitting diode. Although there are no industry-wide guidelines for reporting contrast ratio, most manufacturers follow either the ANSI standard or perform a full-on-full-off test. The ANSI standard uses a checkered test pattern whereby the darkest blacks and the lightest whites are simultaneously measured, yielding the most accurate "real-world" ratings. In contrast, a full-on-full-off test measures the ratio using a pure black screen and a pure white screen, which gives higher values but does not represent a typical viewing scenario. Some displays, using many different technologies, have some "leakage" of light, through either optical or electronic means, from lit pixels to adjacent pixels so that dark pixels that are near bright ones appear less dark than they do during a full-off display. Manufacturers can further artificially improve the reported contrast ratio by increasing the contrast and brightness settings to achieve the highest test values. However, a contrast ratio generated by this method is misleading, as content would be essentially unwatchable at such settings. Each cell on a plasma display must be precharged before it is lit, otherwise the cell would not respond quickly enough. This precharging means the cells cannot achieve a true black,, whereas an LED backlit LCD panel can actually turn off parts of the backlight, in "spots" or "patches" (this technique, however, does not prevent the large accumulated passive light of adjacent lamps, and the reflection media, from returning values from within the panel). Some manufacturers have reduced the precharge and the associated background glow, to the point where black levels on modern plasmas are starting to become close to some high-end CRTs Sony and Mitsubishi produced before ten years before the comparable plasma displays. It is important to note that plasma displays were developed for ten more years than CRTs; it is almost certain that if CRTs had been developed for as long as plasma displays were, the contrast on CRTs would have been far better than contrast on the plasma displays. With an LCD, black pixels are generated by a light polarization method; many panels are unable to completely block the underlying backlight. More recent LCD panels using LED illumination can automatically reduce the backlighting on darker scenes, though this method cannot be used in high-contrast scenes, leaving some light showing from black parts of an image with bright parts, such as (at the extreme) a solid black screen with one fine intense bright line. This is called a "halo" effect which has been minimized on newer LED-backlit LCDs with local dimming. Edgelit models cannot compete with this as the light is reflected via a light guide to distribute the light behind the panel. Image burn-in occurs on CRTs and plasma panels when the same picture is displayed for long periods. This causes the phosphors to overheat, losing some of their luminosity and producing a "shadow" image that is visible with the power off. Burn-in is especially a problem on plasma panels because they run hotter than CRTs. Early plasma televisions were plagued by burn-in, making it impossible to use video games or anything else that displayed static images. Plasma displays also exhibit another image retention issue which is sometimes confused with screen burn-in damage. In this mode, when a group of pixels are run at high brightness (when displaying white, for example) for an extended period, a charge build-up in the pixel structure occurs and a ghost image can be seen. However, unlike burn-in, this charge build-up is transient and self-corrects after the image condition that caused the effect has been removed and a long enough period has passed (with the display either off or on). Plasma manufacturers have tried various ways of reducing burn-in such as using gray pillarboxes, pixel orbiters and image washing routines, but none to date have eliminated the problem and all plasma manufacturers continue to exclude burn-in from their warranties. Plasma screens use significantly more energy than CRT and LCD screens. To reduce the energy consumption, new technologies are also being found. Plasma displays were first used in PLATO computer terminals. This PLATO V model illustrates the display's monochromatic orange glow seen in 1981. In 1936, Kálmán Tihanyi, a Hungarian engineer, described the principle of "plasma television" and conceived the first flat-panel display system. The monochrome plasma video display was co-invented in 1964 at the University of Illinois at Urbana–Champaign by Donald Bitzer, H. Gene Slottow, and graduate student Robert Willson for the PLATO Computer System. The original neon orange monochrome Digivue display panels built by glass producer Owens-Illinois were very popular in the early 1970s because they were rugged and needed neither memory nor circuitry to refresh the images. A long period of sales decline occurred in the late 1970s because semiconductor memory made CRT displays cheaper than the 2500 USD 512 x 512 PLATO plasma displays. Nonetheless, the plasma displays' relatively large screen size and 1 inch thickness made them suitable for high-profile placement in lobbies and stock exchanges. Burroughs Corporation, a maker of adding machines and computers, developed the Panaplex display in the early 1970s. The Panaplex display, generically referred to as a gas-discharge or gas-plasma display, uses the same technology as later plasma video displays, but began life as seven-segment display for use in adding machines. They became popular for their bright orange luminous look and found nearly ubiquitous use in cash registers, calculators, pinball machines, aircraft avionics such as radios, navigational instruments, and stormscopes; test equipment such as frequency counters and multimeters; and generally anything that previously used nixie tube or numitron displays with a high digit-count throughout the late 1970s and into the 1990s. These displays remained popular until LEDs gained popularity because of their low-current draw and module-flexibility, but are still found in some applications where their high-brightness is desired, such as pinball machines and avionics. Pinball displays started with six- and seven-digit seven-segment displays and later evolved into 16-segment alphanumeric displays, and later into 128x32 dot-matrix displays in 1990, which are still used today. In 1983, IBM introduced a 19 inches (48 cm) orange-on-black monochrome display (model 3290 'information panel') which was able to show up to four simultaneous IBM 3270 terminal sessions. Due to heavy competition from monochrome LCDs, in 1987 IBM planned to shut down its factory in upstate New York, the largest plasma plant in the world, in favor of manufacturing mainframe computers. Dr. Larry F. Weber, a University of Illinois ECE PhD (in plasma display research) and staff scientist working at CERL (home of the PLATO System) co-founded a startup company Plasmaco with Stephen Globus, as well as James Kehoe, who was the IBM plant manager, and bought the plant from IBM. Weber stayed in Urbana as CTO until 1990, then moved to upstate New York to work at Plasmaco. In 1992, Fujitsu introduced the world's first 21-inch (53 cm) full-color display. It was a hybrid, the plasma display created at the University of Illinois at Urbana–Champaign and NHK Science & Technology Research Laboratories. In 1994, Weber demonstrated a color plasma display at an industry convention in San Jose. Panasonic Corporation began a joint development project with Plasmaco, which led in 1996 to the purchase of Plasmaco, its color AC technology, and its American factory. In 1995, Fujitsu introduced the first 42-inch (107 cm) plasma display; it had 852x480 resolution and was progressively scanned. Also in 1997, Philips introduced a 42-inch (107 cm) display, with 852x480 resolution. It was the only plasma to be displayed to the retail public in four Sears locations in the US. The price was US$14,999 and included in-home installation. Later in 1997, Pioneer started selling their first plasma television to the public, and others followed. In late 2006, analysts noted that LCDs overtook plasmas, particularly in the 40-inch (1.0 m) and above segment where plasma had previously gained market share. Another industry trend is the consolidation of manufacturers of plasma displays, with around 50 brands available but only five manufacturers. In the first quarter of 2008, a comparison of worldwide TV sales breaks down to 22.1 million for direct-view CRT, 21.1 million for LCD, 2.8 million for Plasma, and 0.1 million for rear-projection. Until the early 2000s, plasma displays were the most popular choice for HDTV flat panel display as they had many benefits over LCDs. Beyond plasma's deeper blacks, increased contrast, faster response time, greater color spectrum, and wider viewing angle; they were also much bigger than LCDs, and it was believed that LCDs were suited only to smaller sized televisions. However, improvements in VLSI fabrication have since narrowed the technological gap. The increased size, lower weight, falling prices, and often lower electrical power consumption of LCDs made them competitive with plasma television sets. Screen sizes have increased since the introduction of plasma displays. The largest plasma video display in the world at the 2008 Consumer Electronics Show in Las Vegas, Nevada, was a 150 inches (380 cm) unit manufactured by Matsushita Electric Industrial (Panasonic) standing 6 ft (180 cm) tall by 11 ft (330 cm) wide. At the 2010 Consumer Electronics Show in Las Vegas, Panasonic introduced their 152" 2160p 3D plasma. In 2010 Panasonic shipped 19.1 million plasma TV panels. In 2010, the shipments of plasma TVs reached 18.2 million units globally. Since that time, shipments of plasma TVs have declined substantially. This decline has been attributed to the competition from liquid crystal (LCD) televisions, whose prices have fallen more rapidly than those of the plasma TVs. In late 2013, Panasonic announced that they would stop producing plasma TVs from March 2014 onwards. In 2014, LG and Samsung discontinued plasma TV production as well, effectively killing the technology, probably because of lowering demand. Panasonic was the biggest plasma display manufacturer until 2013, when it decided to discontinue plasma production. In the following months, Samsung and LG also ceased production of plasma sets. Panasonic, Samsung and LG were the last plasma manufacturers for the U.S. retail market. ^ O'Toole, David Goldman and James (30 October 2014). "The world is running out of plasma TVs". CNNMoney. ^ Archer, John. "OLED TV Thrashes Plasma TV In New Public Shoot Out". ^ a b c d e CNET Australia – Plasma vs. LCD: Which is right for you? ^ a b c d "LED-LCD vs. Plasma". ^ "A plasma lover's guide to LED LCD". ^ "Dell U3014 Review - TFT Central". www.tftcentral.co.uk. ^ "Samsung S27A850D review - FlatpanelsHD". www.flatpanelshd.com. ^ "Sound Advice: Plasma TV sets are better, cheaper". ^ "LCD vs Plasma TVs". Which?. Retrieved 26 October 2011. ^ "Plasma TV -- Mother of All RFI Producers". www.eham.net. ^ PlasmaTVBuyingGuide.com – Step 3: Is a 1080p Resolution Plasma TV Worth the Extra Money? ^ About.com – Are All Plasma Televisions HDTVs? ^ Weber, Larry F. (April 2006). "History of the plasma display panel". IEEE Transactions on Plasma Science. 34 (2): 268–278. Bibcode:2006ITPS...34..268W. doi:10.1109/TPS.2006.872440. All plasma TVs on the market today have the same features that were demonstrated in the first plasma display which was a device with only a single cell. These features include alternating sustain voltage, dielectric layer, wall charge, and a neon-based gas mixture. Paid access. ^ Myers, Robert L. (2002). Display interfaces: fundamentals and standards. John Wiley and Sons. pp. 69–71. ISBN 978-0-471-49946-6. Plasma displays are closely related to the simple neon lamp. 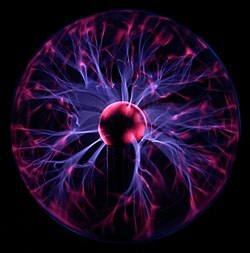 ^ "How Plasma Displays Work". HowStuffWorks. ^ Yen, William M.; Shionoya, Shigeo; Yamamoto, Hajime (2007). Phosphor handbook. CRC Press. ISBN 978-0-8493-3564-8. ^ "Official Panasonic Store - Research and Buy Cameras, Headphones, Appliances, Shavers, Beauty products, and More". www.panasonic.net. ^ PlasmaTVBuyingGuide.com – Plasma TV Screen Burn-In: Is It Still a Problem? ^ "BBC NEWS - UK - Magazine - Do flat-screen TVs eat more energy?". news.bbc.co.uk. ^ "New plasma transistor could create sharper displays". ^ "Bitzer Wins Emmy Award for Plasma Screen Technology". Archived from the original on 2016-03-04. ^ "ECE Alumni wins award for inventing the flat-panel plasma display". Oct 23, 2002. Retrieved Jan 11, 2018. ^ Brian Dear, Chapter 6 -- Gas and Glass, The Friendly Orange Glow, Pantheon Books, New York, 2017; pages 92-111 cover the development and first stages AC plasma panel commercialization. ^ Brian Dear, Chapter 22 -- The Business Opportunity, The Friendly Orange Glow, Pantheon Books, New York, 2017; pages 413-417 cover CDC's decision to use CRTs with cheap video-RAM instead of plasma panels in 1975. ^ "What is gas-plasma display?". Webopedia. Retrieved 2009-04-27. ^ Ogg, E., "Getting a charge out of plasma TV", CNET News, June 18, 2007, retrieved 2008-11-24. ^ Thurber, David (August 25, 1995). "Flat screen TVs coming soon to a wall near you". Eugene Register-Guard. (Oregon). Associated Press. p. 9C. ^ Weber, L. F., "History of the Plasma Display Panel," IEEE Transactions on Plasma Science, Vol. 34, No. 2, (April, 2006), pp.268-278. ^ Mendrala, Jim, "Flat Panel Plasma Display", North West Tech Notes, No. 4, June 15, 1997, retrieved 2009-01-29. ^ "Shift to large LCD TVs over plasma", MSNBC, November 27, 2006, retrieved 2007-08-12. ^ "LCD televisions outsell plasma 8 to 1 worldwide" Archived 2009-05-22 at the Wayback Machine, Digital Home, 21 May 2008, retrieved 2008-06-13. ^ Dugan, Emily., "6ft by 150 inches – and that's just the TV", The Independent, 8 January 2008, retrieved 2009-01-29. ^ "Panasonic celebrates higher plasma TV sales for 2010, sets prices for 2011". EnGadget. March 1, 2011. ^ "LCD TV Growth Improving, As Plasma and CRT TV Disappear, According to NPD DisplaySearch". PRWeb. April 16, 2014. Of course, the growth of LCD comes at the expense of plasma and CRT TV shipments, which are forecast to fall 48 percent and 50 percent, respectively, in 2014. In fact, both technologies will all but disappear by the end of 2015, as manufacturers cut production of both technologies in order to focus on LCD, which has become more competitive from a cost standpoint. ^ "TV shoppers: Now is the time to buy a Panasonic plasma". CNET. October 31, 2013. ^ Will Greenwald (October 28, 2014). "With LG Out, Plasma HDTVs Are Dead". PC Magazine. ^ David Katzmaier (July 2, 2014). "Samsung to end plasma TV production this year". CNET. Wikimedia Commons has media related to Plasma displays.